I have been running Bodhi Linux on my Acer Aspire One Netbook for most of this year but today I finally decided to upgrade to the latest version. The screenshots of Bodhi 2.10 that I had seen looked great and the version I had previously been running was just brilliant. I was well aware that for version 1 of Bodhi I had gone through a fair amount of setting up to get it where I wanted but it was worth the effort because Bodhi is slick. Personally I think Bodhi is the perfect operating system for a Netbook. So what about version 2.10? Read on. To download Bodhi visit (http://www.bodhilinux.com/) and click on either the 32 bit, 64 bit or ARM link depending on the hardware you are installing on. I used Unetbootin to create a bootable USB drive and when I rebooted I was given the option to start in Live mode. Once in Live mode there is an icon on the desktop that enables you to install Bodhi so I clicked that icon and the installer started. 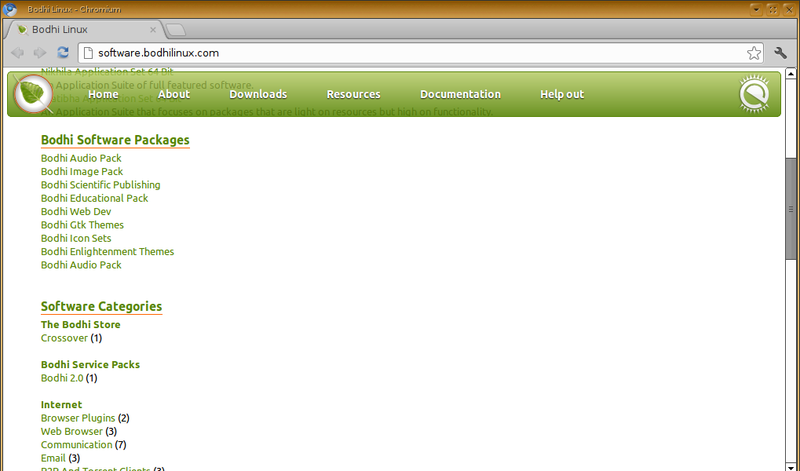 The installer is the same installer that is in Ubuntu, Mint, Zorin and Peppermint. Basically choose whether you want to install Bodhi alongside or in place of the current operating systems on the disk and then choose your location, keyboard layouts, timezone and then setup a username and the installer will do the rest. It takes between 5 and 10 minutes on the Acer Aspire One and once it has finished a message appears asking you whether you want to continue playing in Live mode or restart into the installed operating system. The boot time for Bodhi is quick at around 30 to 45 seconds. The first screen is a log in screen and then when you log in you are given the choice of the theme that you wish to use. 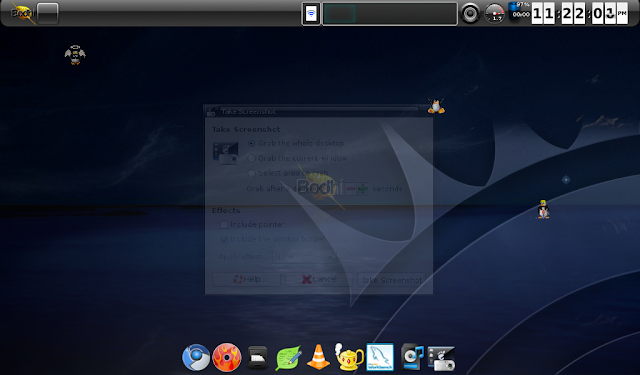 Bodhi provides themes for various setups including laptops, netbooks and desktops. I chose the laptops/netbooks option. I chose the default theme which I think is really bright and clean looking. Bodhi uses E17 and the netbook theme comes with 2 shelves. The top shelf is like your traditional task bar with tasks, virtual windows, the wireless setup icon, audio icon and clock. The bottom shelf provides icons to load applications. Further shelves can be added and the existing shelves can be moved to various other locations on the screen. Setting up the internet connection was easy. Clicking the wireless icon on the top shelf brought up a menu that included both my home broadband connection and my Three mobile broadband connection. To connect to the internet all I had to do was click the relevant broadband provider and enter the security key. Bodhi comes pre-installed with the Midori browser. Midori is a lightweight browser but it works very well. 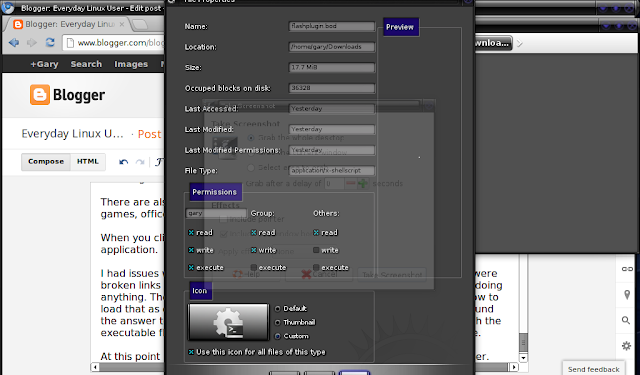 I prefer to use Chromium for all my browsing so I installed it using Synaptic. Flash and Java are not installed by default but they are both available via Synaptic. They are also available from the Bodhi App Centre but I will come to that later. To test Flash I always go to You Tube and as you can see from the image below I was able to view Portsmouth’s FA Cup winning goal against Cardiff City in 2008. I installed Rhythmbox from Synaptic in order to play music and as with the previous version of Bodhi I had a few problems getting Rhythmbox to play MP3 files. I decided to try Banshee instead and this gave me the answer as it told me that I needed to install GStreamer plugins. The plugins that GStreamer installed however did not fix the problem within Banshee and it wasn’t until I went into Synaptic and installed the GStreamer Bad plugin that I was able to listen to music. I should note that after doing this both Banshee and Rhythmbox worked. There is one issue however. 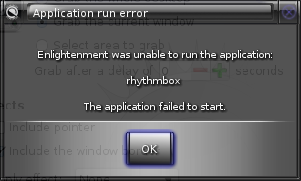 When exiting either Banshee or Rhythmbox I get the message shown by the following screenshot. One of the really good things about Bodhi is the ability to install groups of applications. You can see from the image above that there are different sets of applications including audio, development, icons, themes, images, education etc. There are also links for different categories of application such as internet tools, games, office etc. When you click on a link it provides you with the option to install or download the application. I had issues with both the “Install” and “Download” links. Sometimes there were broken links and other times the Install would just open Chromium without doing anything. The download link would download a .bod file but I was unsure how to load that as double clicking did nothing. After a quick search on Google I found the answer to the problem which was to make the .bod file executable. With the executable flag set it is then possible to double click and install the package. UPDATE: Jeff Hoogland has notified me in the comments below this post that the install link works if you use the default browser that was installed with Bodhi which is Midori. I felt that this information is important enough to move up into the main article. At this point I found another little quirk which was to do with the file manager. As you can see from the image above the file manager goes off the edge of the screen on my netbook and there is no way of resizing it to fit the screen (as far as I know). UPDATE: In the comments below Jeff Hoogland has stated that the file manager issue is to do with E17 dialogs being optimised for screen resolutions at least 768 pixels high. My netbook only has a height of 600 pixels. Again I think this information is important enough to put into the main article. The top shelf has a menu on it which is easy to navigate with an applications sub menu that obviously contains applications, a navigate sub menu which enable you to view navigate the file and folder structure. Then you come to a menu option which says “Run Everything”. Now my instant thought was “Surely not”. Surely there is not a menu option that runs every single application installed on the computer. I was right to think that because “Run Everything” doesn’t run everything at all. When you click “Run Everything” a small application appears that lets you search through the applications, windows and settings for the whole operating system. Simply start typing the name of the application you wish to find and it will appear in the window and you can launch it. To load “Run Everything” you don’t just have to choose it from the menu. You can also load it by pressing “Alt” and “Escape”. On a netbook this function is invaluable. The small dock bar at the bottom only has applications that I use regularly on it. The top shelf is usually hidden behind other applications that are open. To open an application that isn’t on the bottom dock I have to minimise the open applications until the top shelf appears and then navigate through the menu. However by using “Run Everything” I can just use a simple key press and start typing the name of the application I require. 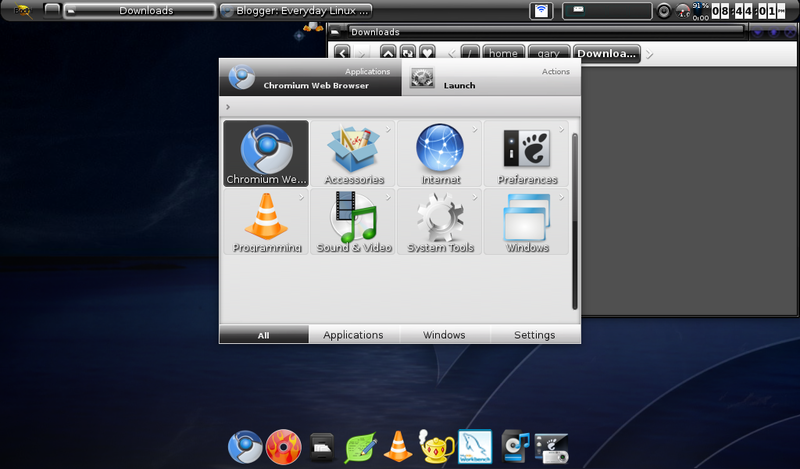 For me this is what stands Bodhi out from other Linux distributions on a netbook. Using a netbook is all about maximising the screen’s real estate and so the less clutter you have the better. Therefore having shelves that hide and an application that can be called upon using a key combination to launch applications is perfect. There are a number of different themes to choose from. I like the default theme that comes with Bodhi but I also like the darker theme shown above. Unfortunately another little quirk comes into play when choosing a theme. On a number of theme selections I lost half the screen and it wasn’t until I turned various plug-ins on and off that I managed to get the whole screen back. I am a fan of Bodhi having used it for a reasonably long time now. This version is not without it’s quirks and issues that have to be resolved. Due to the quirks that I have found I’m not sure it is for everyone, especially beginners. On a netbook Bodhi is fast and responsive and it gives you the full screen to work with. Have you used Bodhi Linux? What are your views? Feel free to comment on this post or any of my other posts. MacPup – How do you like this Apple? The documentation ion the AppCenter explicitly addresses your complaints about the AppCenter. The AppCenter uses AptURL which is currently only supported in the included Midori browser and Firefox. Try using the Install links in Midori and you will get the behavior you're expecting. .bod usage is also addressed in the documentation. You need to make the file executable, then execute it. As for dialogs off the screen, you can hold Alt and then left click and drag the window to get where you can resize it at a corner. Ideally this should not be necessary, but this is a way you can do it. Thanks for the tips Tristam. Gary, what profile was that you loaded? I burned the latest Bodhi the other day, but for the life of me, the network applet doesn't show up at all in the "Desktop" profile, making it impossible to connect to the wireless. I used the netbook/laptop profile. See Tristam's message below for details how to get the network manager. However I have to say that it appeared straight away for me without having to go to the preferences menu. There was some trouble getting network manager appearing right in Bodhi 2. The Network Connections option in Menu->Applications->Preferences will get you where you can connect to your wireless. Thanks for the review… I have an old Toshiba NB205 netbook I "inherited" a while back from a friend after he trashed his Windows with a virus, then immediately went out and just bought a new netbook. I tried a few distros on it. Ubuntu, Kubuntu and OpenSuse ran OK, but were sluggish on it. 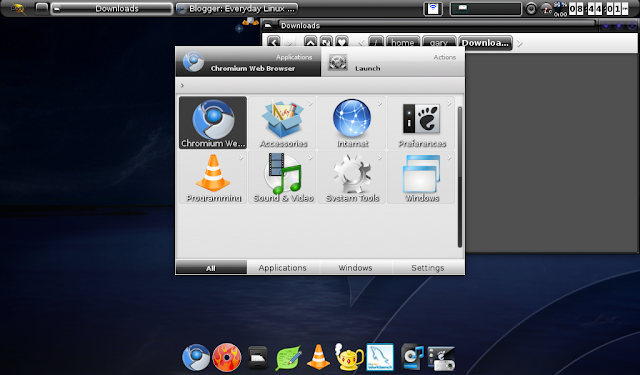 Crunchbang was quick but I didn't really care for XFCE. Then I tried Bodhi and have been running it happily for about 6-7 months. You're right – it is really great for netbooks, even old ones. I downloaded 2.10 a couple nights ago and will upgrade soon. I think E17 is a fantastic DE and Bodhi makes it very simple to get up and running. The forums are great and compliment the Debian/Ubuntu community well. E17 has taken a long time to be stable enough for me to use everyday. I have been running with E17 for over a year now and am very happy. Thanks for the write up! As Tristam mentioned both your complaints about the AppCenter are noted on the AppCenter main page – don't try to use a screw driver as a hammer. As for the window size issue – as with most applications the E17 dialogs are optimized are for 768 vertical resolution – whoever opted for netbooks to have a 600 tall resolution had a sick sense of humor. Finally the error message on Rhythm box – I'll go ahead and drop a bug report to their people – if E17 is displaying that message it means that the application is closing with something other than an "exit 0" meaning it should have encountered an error of some sort. Thanks for the comments Jeff. As your points are key to the article as a whole I have moved them into the main post. I like Bodhi becasue it is light and fast, yet also looks very good. There is a ton of great artwork on the Art Wiki. want something that is going to look nice. Well I too have Bodhi installed on my ASUS Netbook4G. It came with Windows XP installed and it was a nightmare. There's only a 4G HD and (until next week's delivery of my 2Gmodule) 512M of RAM! Needless to say with Windows on it you could turn it on, see the many error and update messages. The drive was 97% full and everything needed to be updated/upgraded. There were few useful programs installed and it had become a paperweight. A friend gave it to me when she got a Nook…she figured I could do something with it. WAS SHE EVER RIGHT!! I have been an Enlightened Linux User since almost the beginning of Enlightened desktops and I am brand loyal. I've tried every other WM and DE and Shell around and always return to E so Bodhi was a natural choice. I too the time to carefully choose packages, themes, icons, wallpapers and configurations. I have EVERYTHING I wanted on it. Cheese, Opera, Mutt, Thunar, Conky…etc…just to give you an idea. I am running a VERY gorgeous E17 desktop that is fantastic for this tiny little screen … and wait for it…all that and I've only used 74% of my HD! I have but one more package to intall (dropbox) and now that I realize I can sync folders of my choosing I AM TRULY A MOBILE WARRIOR NOW! Thanks Linux World- Enlightened Linux Users Rock! It is scary how much rubbish Windows puts on a machine. I have one laptop that runs Windows for work purposes and I turned off automatic updates as I like to choose when to update (I hate the message that says your machine will reboot in 10 minutes). Windows still shows this message despite automatic updates being turned off. Windows = No control. this http://www.everydaylinuxuser.com site is so beautiful.this site depend on bodhi information.I have been running Bodhi Linux on my Acer Aspire One Netbook for most of this year but today I finally decided to upgrade to the latest version. Hi I was using an earlier version of Bodhi a while back and its quirks got to me, However I recently (4 days ago from my CD), have it set up the way I want and am very impressed, its lite & fast & boots in about 15 seconds.